BioCouture is an environmental sustainability project by designer Suzanne Lee to grow fabric for clothing using bacterial cellulose. The resulting sheets can be molded while wet, or cut and sewn when dry. Examples of her work are currently on display at London's Science Museum. It's a good thing people are finally thinking about making clothing out of growable, renewable plant matter that... wait, hang on a sec (checks shirt tag -- 100% cotton)... oh. Never mind. Or Ed Gein. 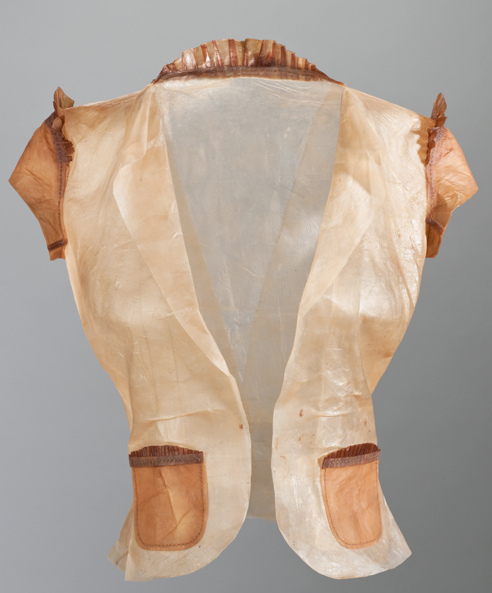 He made all sorts of delightfully whimsical garments from human skin. It puts the fabric softener on the skin.